I have reached this conclusion. Tomoko Kawase wants the world to live in suspense. All of her roughly thirty million side projects/alter egos go on hiatus for an illogical amount of time. “Like Yesterday” is buriguri’s first release since 2008’s “Ash Like Snow,” which sounded a lot more like a Tommy Heavenly6 song if you ask me. I’m happy to say that “Like Yesterday” returns to buriguri’s classic laid-back, “beachy” music. Review time! Like Yesterday- In the spirit of songs like “I’m Jus’ Lovin’ You,” and my personal favorite “Brownie the Cat,” “Like Yesterday” is, as stated earlier, a very laid back song. Its a song that you would listen to at the beach whilst roasting your skin cells in the sun. Another thing it reminds me of is the kind of song that you would play at a graduation. I sure wish this played at my graduation; our senior song sucked. Then again, my entire high school sucked. End rant here. In Conclusion- “Like Yesterday” is a very plain, ordinary song but something seriously drew me to it. Same goes for those Japanese folks buying the song on iTunes; its the fourth most popular download on the Japanese store today. Perhaps this was out of sheer anticipation for a new release. Who cares? Check this song out! That’s right, kids! I am ditching my Sociology homework for the time being to bring you this review. Plus, I’ve got a Hot Pocket that I’m chowing down on. Hooray! Before I start, I’d like to say that I have found copies of “Infinity” for sale online! As soon as my financial aid return check comes in, I will be purchasing it. I am dying to hear the other five tracks. 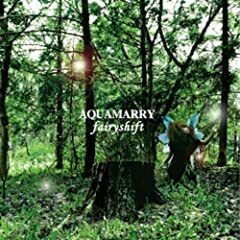 “Fairyshift” is the second release by superindie band Aquamarry, and their first mini-album. This is another difficult to find release in physical format, but unlike the album “Infinity,” “Fairyshift” is available for digital download in the Japanese iTunes store. I’m terribly bummed about this because compared to “Infinity,” “Fairyshift” is just mediocre. Track 2: S.M.W- Yeah, so I have no idea what S.M.W stands for… It’s a really short song at only three minutes. I could best describe this song as “punk.” It’s okay, but not memorable. Track 3: 妄想テレパシー – This song reminds me of a sped-up version of “Mirror Ball” with some guitar similar to that in Nightmare’s “The Last Show.” I like the melody and harmony but again, its not very memorable. Track 4: ホシカゲソウ – This song starts out with some heavy blues elements. Its the longest track on the mini-album, and the entire time I listened to it, I kept waiting for it to go somewhere. It never did. Skip this one. Track 5: LiFE – This is basically a continuation of Shari-la-lira. The guitar is the best part. Not much else to be said. Now this is a song I could wake up to! Seriously, I wish I had an alarm clock that played this song. Its the perfect tune to get you up and about in the morning, and the PV makes it even more uplifting. I want to do exactly what Bonnie is doing; throwing open the curtains and belting out this song. Unfortunately, if I tried to do that today, I’d be slapped in the face by an ungodly wind chill. This style of song is reminiscent of Bonnie’s older stuff that we love so much. I’m glad she decided to go back to that sound for a little while. I think the biggest part of why I like this song so much is because the empowering and happy atmosphere helped me out a lot. A couple weeks ago, my kitty died and I was really devastated. Bonnie’s line “something tells me just keep going, keep going and you will smile again,” was something I could seriously relate to. Rest in peace, Socks. I love you!